With the new political status of Pergamon came a great interest in ancestry and kinship. This interest was, however, not directed towards an authentic history, but towards a history that was defined by famous persons or deeds of mythical heroes. Creating such a history is called syngeneia. How did the Attalid rulers of Pergamon construct their own history by the use of syngeneia? The ancient Greeks had a pronounced interest in ancestry and kinship. This interest was, however, not directed to the authentic history, but to a history that was defined by famous persons or deeds of mythical heroes. So the Greeks did not reconstruct the past so much through concrete evidence from earlier times, but rather with the help of their traditional stories, or myth. This process is called syngeneia and is meant to suggest blood kinship. Syngeneia was among others being used by the Attalid rulers of Pergamon. The Attalids were a remarkable family of low origins, who between 280 and 220 b.C. created a kingdom that put his mark on the political, social and cultural developments of the Hellenistic period and thereafter. In course of time, the Attalids became masters of the art of cultivating an international image, by manipulating contemporary events and taking advantage of every possibility to construct and reconstruct their reputation, thereby rationalizing and legitimizing their power. The oldest ruins found in Pergamon can be dated to the second millennium b.C.. So the city existed long before the first Hellenistic ruler, Philetairos, took possession of it. Philetairos served as an officer under Antigonos Monophtalmos, but followed his general Dokimos in 302 to serve under the rival of Antigonos; Lysimachos of Thracia. He was stationed at Pergamon. Philetairos and other generals formed an conspiracy against Lysimachos, after which he deserted to Seleukos I of Syria, who granted him a certain autonomy over Pergamon. Since then, Pergamon evolved into one of the most important power in Greek Asia Minor, and therefore it was needed that the new political status of the city was ideologically being supported. The Attalid rulers all agreed that the creation of an ideal leader should be of first priority. They started to consider the hero Telephos as their mythical forefather. Telephos was the son of the hero Herakles and Auge, princess of Tegea. The story goes that Auge was seduced by Herakles, after which she was sent away by her father. She ended up in Teuthrania, what would later be known as Pergamon, where she was welcomed by Teuthras, king of Mysia. Here she gave birth to Telephos. He succeeded Teuthras as king of Mysia. Telephos was of great importance as forefather, because he played a role in legends on the Trojan war. The story of the hero is represented on a frieze of the Pergamene Athena temple. The temple was dedicated to this goddess, because she was proclaimed as protrectess of the city, after Philetairos detached himself from Lysimachos and founded a state on the fortress of Pergamon. The choice for Athena represented the unity between the Attalid dynasty and the Greek motherland. Besides that, it was made clear to the viewer that the Attalid dynasty descended from Zeus. Herakles, the father of Telephos, was after all the son of Zeus. The appropriation of Telephos as mythical ancestor is an example of how the system of mythological genealogy can be used for mental appropriation, to increase the status of an city that didn’t matter before. The Attalids did not only make use of syngeneia to give their own history more allure, but also to establish ties with other cities. One of those cities was Aegina, which was being ruled by the Attalids. To save their face, they donated a statue of Telephos to the king of Pergamon, by which they explicitly referred to their kinship ties with the Pergamenes. The city of Tegea also didn’t have negative feelings towards Pergamon, even though both cities claimed to be descendants of Telephos. By accepting the claim to kinship, Tegea hoped that Pergamon would be as generous towards them as they were towards other cities on the Greek mainland. The city also had another reason to affiliate themselves with Pergamon. Even though Tegea was a famous ancient city, it didn’t play an important political role in the Achaean League. To be the mother city of a Hellenistic royal capital and to have a wealthy, famous and influential daughter city, strengthened the self-confidence of Tegea towards their neighboring cities and allies in the Achaean League. Speaking in terms of network theory, one would assume that we are dealing with a centralized network here (also known as core-periphery-model), where one node is dominant and the other nodes play a subordinate role. Pergamon incorporated ancestors of surrounding cities in her own mythical history. One would think that these cities wouldn’t agree on that. But we have seen that these cities accepted these claims on kinship, because of several reasons. So, we are not dealing with a centralized network, but with a distributed network. This is also referred to as peer polity interaction, where equipollent, interconnected communities interact with each other. In this way, a horizontal network instead of a vertical network is being created. Allen, R. The Attalid Kingdom: A Constitutional History. Oxford: Clarendon Press, 1983. Hansen, E. The Attalids of Pergamon. Ithaca en London: Cornell University Press, 1971. Schmidt. 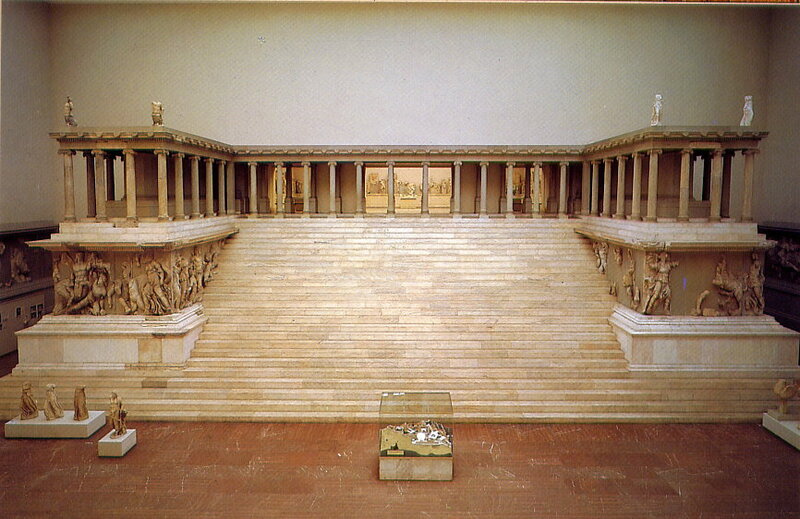 E, The Great Altar of Pergamon. Leipzig: VEB Edition, 1962.